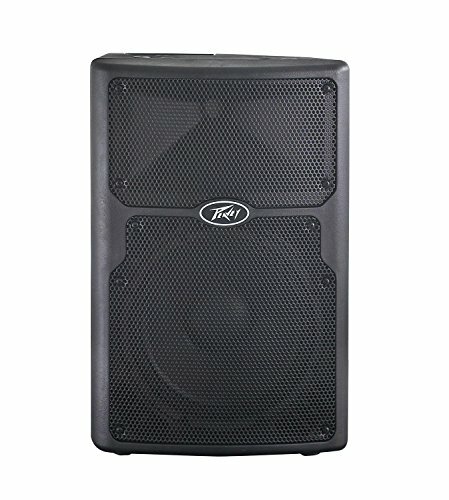 Peavey PVX 10 800 Watt 10" 2-Way Pro Audio PA Speaker. Program Power Handling: 400 Watts. Peak Power Handling: 800 Watts. Two-Way Sound Reinforcement Enclosure. Crossover Network For Driver Protection And EQ. High Frequency Driver Protection. Durable Plastic Injection-Molded Trapezoidal Enclosure. Asymmetrical Horn Aims The Sound Down 10 Degrees, At The Audience, Not Over Their Heads. Full-Coverage Heavy-Duty Perforated Steel Grilles, With Powder Coat Finish. Pole Mount Molded-In. Top And Bottom Flying Point Inserts. Patented Quadratic Throat Waveguide Technology, 100° x 60° Coverage. RX 10N Compression Driver, With 1" Titanium Diaphragm. 10" Heavy-Duty Woofer With 2.4" Voice Coil & 50 Oz. Magnet. Extra Angled Section On Right Side Allows Floor Monitor Use. Product Weight: 25 lb. Product Dimensions (H x W x D): 20" x 12.7" x 11.06" inches.